One of the largest and well-known hotels on the Black Sea coast, luxurious and comfortable and in a great location at the heart of the resort. A group of 20 of us stayed at the hotel in July 2011, we expected dirty rooms, poor service and awful food more of a 2* standard than 5*, we got a slightly dated but beautiful, clean large hotel with huge bedrooms and pleasant staff. Yes the carpets were slightly worn and there were a few stains, yes the hot water was unreliable and yes the hairdryers were useless but overall the rooms were fine. Not enough hangers and the thinnest pillows I have ever slept on. The restaurants were ok, queuing of course, but that is all-inclusive for you, the Romanians, and there were a lot of them, obviously do not believe in waiting their turn. Food was ok, bit repetitive especially the breakfast that never changed, not even the variety of fruits available, a big criticism is the way to reserve the specialty restaurants, we failed to book even when queuing up at 8.45, it would be much better to have a first come first served basis. There seemed to be empty tables during the evenings even though we were told they were completely fully booked. There was some confusion about the all-inclusive option at the other hotels, bars and pools within the Grand Hotel Resort, there were people with different colour bands using the pools and bars in our hotel but we were refused in some of the other hotels even though some staff in our hotel had told us we could use facilities in any of the resort hotels, it was confusing. No ice cream at our hotel either, you had to go to another hotel, not much good for the children. The children's pool smelled of urine, parents should make sure that babies and toddlers wear swim nappies, as we did. Value for money was excellent. Would we go again? Definitely! Just watch out for the mosquitoes in the evenings. Upon arriving at the Grand Hotel Varna, I was greeted by what I now consider the best possible staff a hotel can have. I am no stranger to five star hotels, fine dining, and good service. But the staff at Grand Hotel Varna surpasses it all. The staff is responsible for making my trip one that I will never forget. Their professionalism, hospitality, conscientiousness, attention to detail, and overall ability to make the whole operation appear seamless is remarkable. The hotel itself is also beautiful. There is no better place to be than in one of the cabanas by the poolside with a cocktail in hand. A true tropical paradise! The restaurants are also a great way to bask in the sunshine and enjoy the natural beauty of Varna enveloping the hotel grounds. I loved the daily "Animations" throughout the hotel and watching the other guests enjoy themselves while spending time with their friends and family. The hotel has a great atmosphere overall and makes one feel welcome, relaxed, and of course, pampered. Bulgarian food is absolutely fantastic. I couldn’t get enough of the vegetables, the yogurts, the cheese, the bread, the pastries, the spices, the meats, and the wine! The long trip from the U.S. to Varna is well worth it to have a Bulgarian feast, and the chef at the Grand Hotel Varna could not make Bulgarian food taste better. I cannot express how much I enjoyed by trip to Bulgaria. 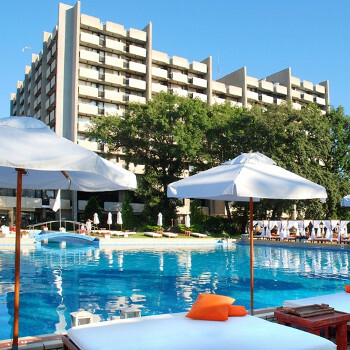 There is no way I will not return to Bulgaria, to discover more of this hidden gem of a country, and to visit my friends at the Grand Hotel Varna. First time visit to Bulgaria so therefore first time at this hotel. We booked the late holiday to avoid the summer heat and the weather was 80% fine and warm. The hotel was spotless, designed I was informed by Swedish Architect and I think furnished by Ikea, very functional. The food was typical Med type buffet with a wide selection to choose from. Only commenht it seems that Bulgariand prefer their food warm, rather than hot. Staff were helpful and friendly and although we didnt use them there was just about everything for the swimmer and the work out lovers. Oh yes the internet connection is slow but free. Me and my boyfriend visited Grand Hotel Varna last summer. Travelled with Balkan holidays. As we have never before been to Bulgaria we did our research along all the info from the travel agent. Just to know what to expect. The hotel is amazing. Very very clean, it appereas to be recently renovated, rooms were very big with very nice views. Staff was fluent in english, very helpful and quite polite. There are so many things you can do in the hotel. Absolutely fab. You can never be bored. They have some cool restaurants and nice bars. Bulgarian food is similar to the Greek and the Turkish one. As Greek food is our favourite - this was the place for us, but there was also fresh fish and mediterranean type of cuisine in the number of restaurants. Though we did not go to all of them in the complex. The thing to die for was the spa in the hotel. I was treating myself almost half of the time we were there. Did the majority of the treatments and I feel so much energised. The money spent are half the price I will pay here in London for only one of these treatments. Unbelieaveble. Bulgaria is a total surprise for us. Very beautiful place to visit. Not too expensive and great weather. My boyfriend is a sports fanatic and he enjoyed the trip as well. They have very nice diving centre. he was hooked on that. All in all I think we had a very nice holiday. nice beach and clean sea. Definetly going back there again. Totally recommend Grand Varna hotel. This is a genuine 5* hotel and cannot be faulted. Have known it for years but never actually stayed there before. The reception area was modernised over winter and is now most elegant. Other parts of the hotel have also been renovated and it was most comfortable in all respects. We will be returning next year!